Pole vault: don’t be afraid to fly. While all athletic disciplines have their unique attributes, pole vaulters are a special breed. They take part in one of the most spectacular and difficult of all athletics events. Combining agility, speed and sheer strength, pole vaulters flying into the air never fail to capture a gasping audience wherever they compete. At Keilor St Bernard’s Athletic Club, we have our own specialist pole vault group. A specialist coach takes training at Aberfeldie, a venue which Athletics Essendon has made available. All athletes are welcome to come down and try out for pole vault. 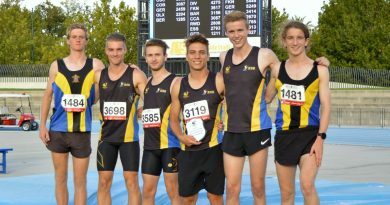 Membership* is open to both Athletics Victoria Yellow zone members and Little Athletes from the North West zone. *A fee per pole vault training session is charged once you have joined.